Cassie Sainsbury faces terrifying experience if convicted. Cassie Sainsbury faces terrifying experience if convicted of cocaine possession, author says. 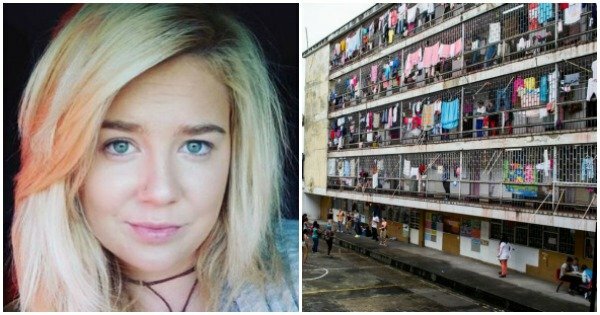 An Adelaide woman detained on drug trafficking charges in Colombia could face a “very terrifying experience” behind bars if she is convicted, the author of a book on South American prisons has warned. Cassie Sainsbury, 22, was arrested after she was found in possession of 5.8 kilograms of cocaine at El Dorado International Airport in Bogota on April 12. Her family maintains she was set up, but if found guilty Ms Sainsbury could be sentenced to up to 25 years in a Colombian prison. Australian author Rusty Young, who wrote Marching Powder — a book based on real-life experiences inside South American prisons — said overcrowding, dirty conditions, and sickness were a common experience for inmates. “[I would be] very concerned. The conditions in South American prisons can be pretty rough at times,” Young said. “[The male prisons] have guns and grenades and, in some cases there are wars between the various terrorist organisation members who have been caught. “It’s obviously still a very terrifying experience compared to living in comfortable Australia. If incarcerated, Young said Ms Sainsbury might struggle to access some basic services like medical care or even a bed in her cell. “If you’ve got money in these prisons then you can have a decent lifestyle and you can buy certain comforts and certain privileges from the guards and from other prisoners — money is king, basically,” he said. Young said despite popular perceptions of Colombia as a corrupt nation, it was likely Ms Sainsbury would have access to a fair trial. "I&apos;ve lived there for eight years, I&apos;ve worked with the government there, and I believe, particularly for these sort of low-level cases, I don&apos;t think the judicial system is corrupt at that level," he said. "So I think there&apos;s a pretty good chance she&apos;ll get a fair trial. The question is, &apos;what are the facts of the case?&apos;"
Ms Sainsbury&apos;s family engaged the services of a local lawyer and set up an to raise money. Her mother, Lisa Evans, has maintained her daughter&apos;s innocence, saying she was given a package she thought contained headphones before stowing it in her luggage. Young said the trial could take many years and "tens of thousands" of dollars to pay for court costs, translators, lawyers and potential appeals. "I think Colombia realises it&apos;s in the spotlight all the time and they don&apos;t want to make a mistake by convicting someone incorrectly, so they will try and be as light as possible, providing the person cooperates," he said. "Colombia is always getting the blame for the international drug trade, but they&apos;re not going to give completely favourable treatment to someone just by virtue of being a foreigner."